John was born on August 1, 1965 in Sheboygan, Wisconsin, son of the late John “Jack” and Doreen (Luedtke) Masterson. 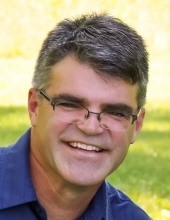 He attended schools in Sheboygan Falls and graduated from Sheboygan Falls High School in 1983. John worked several years for his father in the plumbing business. He then attended University of Wisconsin - Stevens Point and graduated in 1992, earning a degree in Aquatic Biology. John married his best friend and love of his life, Cheryl Peterson, on May 7, 2011. John is survived by his wife Cheryl, wonderful daughters Maggie and Katherine, sister Margaret “Peggy” (Mike) Hahn of Sheboygan Falls, brother Hugh of Sheboygan, WI, and father- and mother-in-law Frank and Louise Peterson of Random Lake, WI. He is also survived by brother-in-law Phil (Denise) Peterson of Pewaukee, WI and sister-in-law Carolyn (Jeff) Richter of the Town of Scott, WI. John is also survived by aunts, uncles, nieces, nephews, and many other relatives and friends. John was preceded in death by his sister Colleen Masterson and his parents. John worked for the Wisconsin Department of Natural Resources for 23 years as a water quality biologist and Lake Michigan program coordinator. He was very proud of this work protecting and restoring streams and lakes in southeast Wisconsin. John made many wonderful friends within the WDNR and looked forward to work every day. John’s hobbies included hunting, fishing, hiking, gardening, traveling, and spending time with his family. John especially enjoyed the annual deer hunting and trout fishing camps. John is a member of the Holy Name of Jesus Catholic Church in Sheboygan. Funeral services will be held on Saturday (January 26, 2019) at the Suchon Funeral Home in Plymouth. Visitation will take place from 11:00 A.M. – 3:00 P.M. with Services to follow. Father Matthew Widder, Pastor of Holy Name Catholic Church will officiate. Burial will be in St. Mary’s Cemetery in Sheboygan Falls, WI. The family would like to give a special thank you to the staff at the Vince Lombardi Cancer Clinic and the Sharon Richardson Community Hospice. The care John received was wonderful. To send flowers or a remembrance gift to the family of John P. Masterson, please visit our Tribute Store. "Email Address" would like to share the life celebration of John P. Masterson. Click on the "link" to go to share a favorite memory or leave a condolence message for the family.